Anacardiaceae is a family of tropical and subtropical flowering plants, with a scarrce representation in temperate climates. Trees and bushes, sometimes ornamental, such as Rhus typhina, Schinus molle or Cotinus coggygria; species with worldwide-known fruits, like the Mango (Mangifera indica) and the Pistachio (Pistacia vera); source of tannins for the industry and of precious lacquer, such as the one extracted from the sap of Rhus verniciflua. They do not lack, like in many plant families, traditional as well as promising medicinal properties. 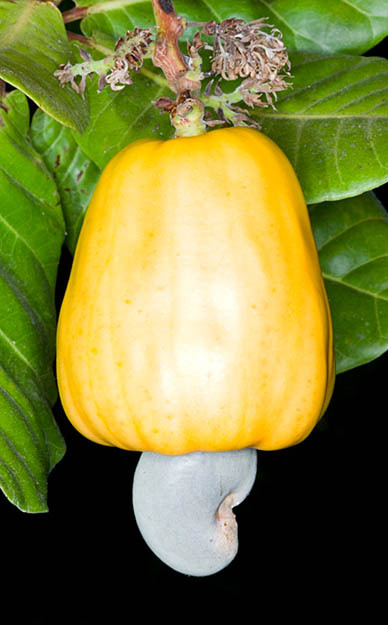 Some species produce strong poisons present in resinous exudates, the trunk, the leaves, or particularly concentrated in the fruits, like in Anacardium occidentale. Their flowers, generally bisexual, are characterized by the presence of 5 sepals fused together, 5 free petals and 5-10 stamens. The fruit is usually a drupe. Abrahamia, Actinocheita, Amphipterygium, Anacardium, Androtium, Antrocaryon, Astronium, Attilaea, Blepharocarya, Bonetiella, Bouea, Buchanania, Campnosperma, Campylopetalum, Cardenasiodendron, Choerospondias, Comocladia, Cotinus, Cyrtocarpa, Dobinea, Dracontomelon, Drimycarpus, Euleria, Euroschinus, Faguetia, Fegimanra, Gluta, Haematostaphis, Haplorhus, Harpephyllum, Heeria, Holigarna, Juliania, Lannea, Laurophyllus, Lithraea, Lithrea, Loxopterygium, Loxostylis, Malosma, Mangifera, Mauria, Metopium, Micronychia, Mosquitoxylum, Myracrodruon, Nothopegia, Ochoterenaea, Operculicarya, Orthopterygium, Ozoroa, Pachycormus, Pegia, Pentaspadon, Pistacia, Pleiogynium, Poupartia, Protorhus, Pseudosmodingium, Pseudospondias, Rhodosphaera, Rhoeidium, Rhus, Schinopsis, Schinus, Schmaltzia, Sclerocarya, Searsia, Semecarpus, Smodingium, Sorindeia, Spondias, Tapirira, Terminthia, Thyrsodium, Toxicodendron, Trichoscypha. → To appreciate the biodiversity within the ANACARDIACEAE family please click here.